Some friends and I were fortunate to do a little fishing in nearby North Carolina recently and it was so much fun we kept going back. 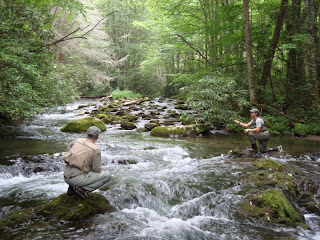 Between Sunday, June 28th and Saturday, July 4th, we hit some of the small Smokies streams for wild trout as well as the larger western NC rivers for smallmouth on three days. Actually, those are just the days I got to fish; my friend The Dredger was on vacation that week so he really abused the privilege and, I think, fished there on five of the seven days, catching this nice 15" brown on one trip. We've been pretty darn blessed in Georgia this summer with good rainfall and relatively cool temperatures but, being at this altitude and, for the most part, fishing streams on the south-facing slope, we have seen water temperatures in the high 60's and even above 70 degrees on the larger streams. If you read my earlier post, you know that I've spent some time fishing for shoal bass on the Chattahoochee River lately but I had guests coming in from Alabama the last weekend of June and they really wanted to trout fish. So I decided to take them somewhere they had never been before, The Smokies. As we drove through downtown Cherokee, I'm sure they were thinking I had lost my mind but they both breathed a sigh of relief as we stepped out of the truck on the banks of one of the most underfished streams in the Park just a short drive north of town. Even in mid-afternoon, the water temp registered just 60 degrees. Quicker than you can change tippets, everyone had their short rods out and rigged with an attractor dry fly with small nymph droppers. Today, most of the fish were taken on the nymphs with size 18 pheasant tails doing the bulk of the work but a big Mega Prince did entice one nice 12"rainbow out of a deep run for me after fishing it with the pheasant tail for quite a while. Later in the afternoon, we moved upstream as our guest leap-frogged from pocket to pocket picking up small wild rainbows on both dries and nymphs. For two guys who probably envisioned fishing all weekend for big fish, it was a pleasant surprise and one that challenged everyone's skills. And even better, we only saw two other anglers all day on this stream. 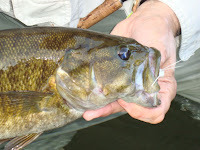 The following Friday, after receiving reports from Dredger on the big smallmouth he had caught the day before, I was coerced into making another trip back to western NC that afternoon. We fished until dark -thirty and I used nothing but a white popper with big rubber legs. What a blast! This section of North Carolina has two very good smallmouth streams, the Tuckaseegee downstream from the dam at Dillsboro to Bryson City and the Little Tennessee River between Jackson and Fontana Lake (also near Bryson City). Both are big rivers but offer good wading and floating opportunities for smallies. I'm still learning about river smallmouth and I find myself absentmindedly fishing as if I'm after trout on these rivers. 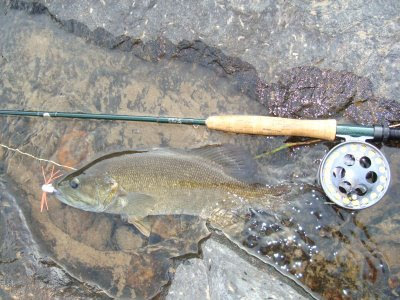 It sure seems that smallmouth waste some great runs and riffles in favor of the frog water at times. But it only takes a couple of nice leaping brown bass to help me focus. Interestingly, the fish these days were not overtly aggressive. A good cast into likely holding areas, one twitch of the fly and... wait. If you continuously stripped your fly, you likely got nothing. If you waited patiently, you were often rewarded with a boil on your bug. This first evening I counted 11 strikes before I landed a fish. Talk about a teaching opportunity! We ended the day with probably 18 or 20 fish with the largest being a nice 16-incher right before we left. On the ride home, we discussed whether or not we were up for trying it again the next day, Saturday. When you roll in after 11 PM, you have to fight the urge to sleep late the next day. So, we decided to meet again the next morning and head back to the Smokies then finish up the day harassing the smallies again. Sleep can come later. 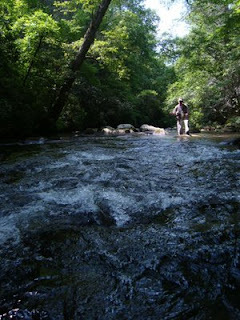 This time we headed for another stream in the Park near Bryson city. This would allow us to be very close to our evening rendezvous with the smallies. The trout streams in this section of the Park are classic "pocket water". Almost any little place that looks like it should hold a trout, does. Early in the day, I mistakenly made the call that we were only finding fish in the rough water at the head of pools. Only later did I realize how many fish we were spooking from the slower pools and runs. You literally could not get within 30 feet of these fish without them bolting into the next drainage if the water was the least bit placid. Realizing this helped and, with longer casts and more stealthy approaches, we began picking up fish before we spooked them. Again, on this day we caught more on nymphs than dries but there were enough on dries to create a lot of hootin' and hollerin'. We saw three other anglers all day on this stream which does not require a long hike to get to. Again, we finished up the day stalking smallmouth and the rewards for me were two 16-inchers along with a host of smaller fish; all one of Kent Edmonds' Stealth Bomber in white with orange ru gger legs. It was deadly! the river this day had a lot of swimmers and tubers but by the time we hit the water at 4 PM most of them were leaving. My second fish of the day was one of the big 16 inchers that I pulled from slow water withing a hundred feet of a frolicking couple playing in the shoals nearby. On a side note, the next time I head up this way I'm taking flies for carp and redhorse suckers. There are some really big boys cruising the shoals and gravel bars on these rivers and it would be like sight fishing on the flats except you wouldn't have to make long casts. These big rivers are a tremendous fishery and within an easy drive of north Georgia. 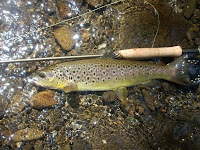 If you drive up to fish the delayed harvest sections of the Nantahala or Tuckaseegee, or the trophy stream in Cherokee, these are within your range. 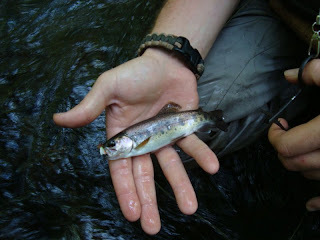 A large part of small stream summer fish ing is the discovery. Virtually every stream in this section of the Park has the same geologic characteristics and will fish about the same regardless of which one you find. Get a map of the Smokies and start plotting your own trip destinations. And if you want that big fish fix, reserve some time for the waters of Cherokee or the big bass waters on the Tuckaseegee and Little Tennessee Rivers. It's not that far away and is a great alternative to your home waters when they get too warm.